I got this list of http://blog.livedoor.jp/kettouc/ . Not sure if it is the actual list, but its previous list was almost 100% right, except for 1 card which i cant remember which and it added it in the next day. As per topic, it is UNCONFIRMED. So believe it at your own risk. Something caught my attention as i was watching the video of Singapore qualifiers. Not sure how much life the opponent (with snowman) has, but if as long as he has more than 2300LP to survive the attack from gear x, then he might be able to survive that turn. regardless, i am trying to highlight the importance of knowing the various substeps of the damage step. Lets have a look at these 2 cards: Drilloid and snowman. 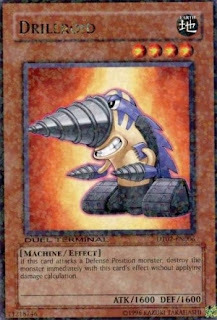 Effect: If this card attacks a Defense Position monster, destroy the monster immediately with this card's effect without applying damage calculation. 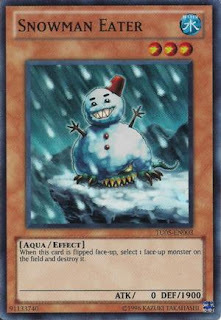 Effect:When this card is flipped face-up, select 1 face-up monster on the field and destroy it. So, lets have a visit to the various sub-steps of the damage step: taken from pojo, and i have taken only the key points of various substeps. Some cards have effects that activate at the start of the Damage Step. Monsters like "Steamroid", "Rampaging Rhynos", "Crystal Beast Topaz Tiger", "Etoile Cyber", "Super Robolady", "Super Roboyarou", "Black Veloci", and "Jain, Lightsworn Paladin" with Continuous Effects that are applied when attacking a monster, attacking directly, or being attacked are applied at this time without starting a Chain. Some monsters have Trigger Effects that activate when attacking a face-down monster and start a Chain at this time because they do not flip the face-down monster face-up, like "Neo-Spacian Grand Mole", the "Mystic Swordsman" cards, "The Six Samurai Irou", "Razor Lizard", "Sasuke Samurai", and "Sasuke Samurai #4". Each of these effects destroys, etc. the monster without flipping it face-up or applying damage calculation. If the monster being attacked is face-down, it is flipped face-up at this time. If the monster has a Flip Effect or a Trigger Effect that activates when it is flipped face-up, the effect will not activate at this time. Sometimes the flipped monster will have a Continuous Effect that causes it to "self-destruct" if proper field conditions are not met ("Giant Kozaky", "Zombie Mammoth", "Thunder Nyan Nyan", etc.) When this occurs, the monster is not immediately destroyed. Damage calculation is still conducted. If the monster is destroyed by the battle, its effect is not applied. If the monster survives the battle, it is destroyed by its effect after damage calculation. After damage calculation, the infliction of Battle Damage, and any effects that activate as a result, the Damage Step has a section devoted to dealing with the Flip Effect of the Flip Effect Monster that was flipped face-up by the attack. If the flipped monster had a Trigger Effect that activates when the monster is flipped face-up ("Royal Keeper", "Nightmare Penguin", etc. ), it will be activated at this time. As you can see, snowman eater effect activates at substep 2 and flips face up while drillroid was mentioned specifically in the example that it activates in substep 3. that is to say, when drillroid attacks a face down snowman, snowman's effect can be activated since it takes place at substep 2. Wikia also has this scenario updated under the rulings section, Jap wikia also has this too. Q: If you attack a monster reverse effect of the backside defensive display with this card, the timing of the imposition of a reverse effect or Effect Monster When will reverse. Q: If you attack a monster to trigger the effect of inducing effects when you reverse the monsters of view behind the defense on this card, do you want to invoke the induced effect. ever since the release of this card, many have been comparing this card with MST. again, this is something like comparing PWWB and rageiki break. it really depends on the situation, so there is no definite answer as to which card is better. so lets take a look. Effect: Target 1 Set Spell/Trap Card your opponent controls; destroy that target. Your opponent cannot activate the targeted card in response to this card's activation. sometimes, i felt that i have "earned" from MST mainly because i MST the card during the end phase of my opponent. then you might ask,why would i feel that way? for a simple reason, because my opponent cannot activate it, since it has just been set. feel something similar? thats exactly what this card does! 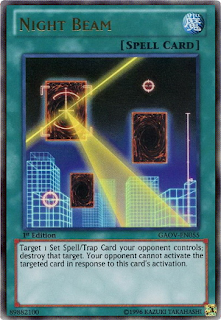 it is indeed true that your opponent can activate another card in response to this card, and then chaining that card being targeted by night shot. but think again, you are forcing your opponent to waste another card unnecessarily. and that can be an advantage for u! not only that, how many times can u chain another card and then chaining the card targeted by night shot without making losses?or unnecessarily? or even just to pull that off? furthermore, night shot avoids the situation whereby u activate MST and hit a MST of your opponent's on your turn and make a loss. still remember that awful feeling? of course, on the other hand, there are certain cases whereby MST is better. things like MST opponent's call of haunted when he activate it on his turn, or MST away an already face up macro cosmo or something threatening. 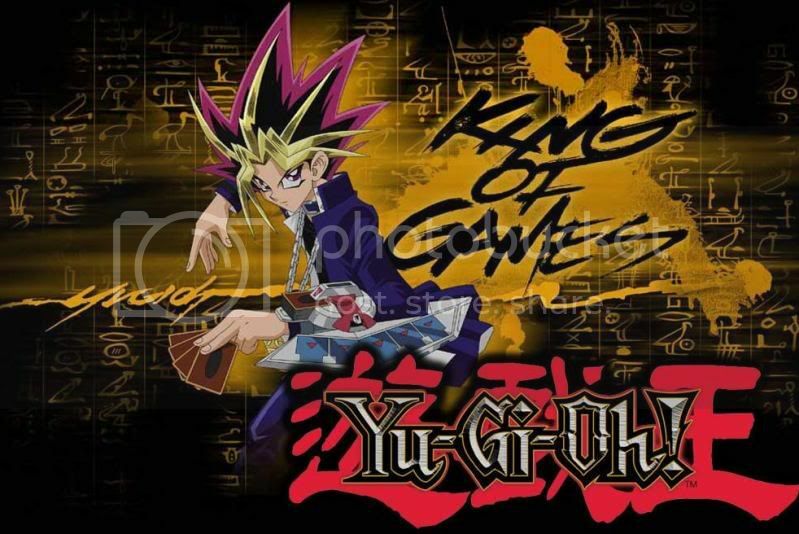 A YUGIOH Duelist.Please do email me if you have any questions regarding rulings,card sales,game plays etc.